This Thermal Transfer label has an ultra smooth coated facestock which provides premium barcode printing for high and medium speed printers. This product is suitable for use in applications where high quality barcode printing is critical. The adhesive is a general purpose removable adhesive featuring moderate initial tack and minimal adhesion build over time. Its consistent level of adhesion and long term removability make it suitable for applications on substrates such as glass, plastics, and corrugated cardboard. 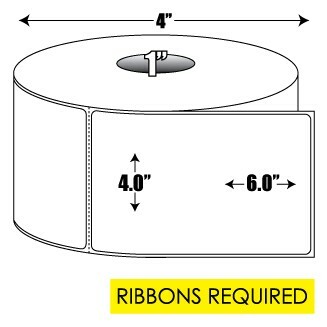 It has also been found to adhere well to curved glass and plastic substrates approaching 1 inch diameter. It has a minimum application temperature of +40 degrees F and a service temperature range of -65 degrees F to +180 degrees F. We recommend testing this material with all applications. We will gladly send you a sample to test in your label application, simply call 888-325-2626.